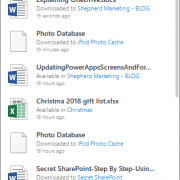 With all the options for where to place files and share them on the Office 365 platform, it’s difficult to know where you should put files and how you should share them. 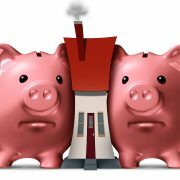 If you use a house model for thinking about sharing documents, you can make it quick and simple for you – and your colleagues – to make good decisions on file placement. On the Office 365 platform, you get OneDrive, SharePoint, Groups, Teams, Exchange, and a host of other tools that can be used to share information. However, knowing which one to use when, can be challenging. (If you want to know more about the problem with choices, see The Paradox of Choice.) However, there’s some relatively straightforward guidance once you get past the noise. Exchange (and Outlook) – One-time exchange of a file. It’s a bad plan if there’s collaboration happening where multiple people will be modifying the file and creating multiple versions – but it’s the historical approach to share a file. SharePoint – When you’re sharing files in a team or inside the organization to a few – or many people – SharePoint’s the first choice. It’s designed to be a space for collaboration. OneDrive – OneDrive replaced the concept of personal or home drives on a network. OneDrive is intended to be personal space where you’re not routinely sharing information with others. One complication is that there’s some difference between the kinds of sites that you have in SharePoint. Some sites are designed for team collaboration, and some sites are designed for organizational communication. Because you can have multiple SharePoint sites, and they can have different purposes, it’s important to realize that placing files on SharePoint means additional decisions about which site to place the file in. Let’s think about the sharing options differently. Let’s think about them in the context of how you share your home with others. If you’re at least moderately social, you’ll invite people over to your house. However, even when you’re inviting others over, not everyone is invited to roam your house freely. Consider that only a few people are invited into your bedroom – and typically only for a small set of reasons. Access to the bedroom is private space and therefore requires more trust, safety, and need. You may want to think about your personal OneDrive as your bedroom. You only invite people to be in (share) your bedroom in very narrow circumstances. Kitchens tend to be the focal point of gatherings. There’s a tendency for your friends to hang out in the kitchen – probably not the least of the reasons being food. Kitchens are a place that friends and acquaintances are invited on a regular basis. SharePoint sites, like kitchens, are made for sharing, and invitations generally flow quickly. Moving past friends to those that you know only remotely or casually, you would likely invite them into your foyer or entryway for a short time to get out of the rain or cold. When the neighborhood association president stops by, even if you don’t like them, you’ll typically invite them into the entryway of your home for at least a few moments before wishing them on their way. This is the kind of sharing accomplished via email. You don’t expect – or hope – that they’ll be back, and you have a level of trust that they’ll do the right thing with the document, but you don’t trust them more than that. Despite the dizzying array of sharing options on the Microsoft platform, you can make informed decisions by considering just how far into your house you want to let people in – and for how long. The most frequent confusion that I encounter with users is related to what are OneDrive and OneDrive for Business, and how do I know the difference. There’s good reason for this. The OneDrive brand has been used to refer to two different services and multiple different components. To be simple about it, OneDrive is the cloud file synchronization platform for Microsoft. OneDrive keeps files on your PC in sync with files on a cloud-hosted server. OneDrive has a personal and a commercial offering. In the commercial offering, OneDrive is also the mechanism that is used to synchronize SharePoint sites. This is the consumer-based offering that is available for free for a few gigabytes. It provides the same kind of synchronized files feel as competitors like Google Drive, Box, DropBox, etc. The files look like they’re on your PC – which they may or may not be – but there is a copy stored (and backed up) on a server in the cloud. You can view your files either on your PC or via a web browser on the cloud-hosted storage. OneDrive for Business surfaces the same features as the personal version and largely looks identical, except that there is additional storage available. However, OneDrive for Business creates the capability to not only synchronize a personal space for files, but also to synchronize shared files that live in SharePoint sites across the organization. This capability means that you and your colleagues can have synchronized copies of the same files from the places that you work together. The program that manages the synchronization of files for both OneDrive Personal and OneDrive for Business is simply called OneDrive. It’s included with Windows 10 but is also available for earlier operating systems. In the past, Microsoft also had a separate program for synchronizing OneDrive for Business. This tool evolved from Microsoft’s acquisition of Groove and went through a series of name changes before ending at OneDrive for Business. This synchronization tool has been deprecated for all situations except for synchronizing files from on-premises SharePoint servers. The OneDrive program will display multiple cloud icons on your taskbar – but these are the same program. The blue cloud is your OneDrive for Business connection, and the white cloud is your OneDrive personal connection. When the OneDrive program is synchronizing to the cloud, you’ll see a set of circular arrows. When the arrows aren’t present, the program is not synchronizing any files. 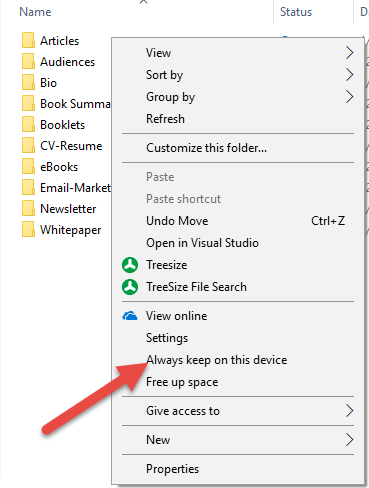 You can see with OneDrive whether a file is synchronized, available for download online, or needs to be synchronized by looking at the icons in the file explorer – or the file open dialog. The green checkmark next to a file means that the files is downloaded and available locally. The blue arrows indicate that the file is synchronizing – either from the local machine to the cloud storage or from cloud storage to the local machine. The final icon is the cloud icon, which indicates that the file is available online only or that the whole folder isn’t available offline. If you click on the file, it will be transparently downloaded to your local system and the default application for the file will be launched. The name for the feature that allows you to connect OneDrive to cloud storage but not download all the files is called “files on demand.” The files, as indicated above, are downloaded on demand. When they’re needed, they’re downloaded, and eventually, as the PC needs more storage – or the file is changed on the server – the files are removed. This allows you to synchronize even very large libraries without needing to have all that storage on your local system. If you know that you’re going to want to have the files available to you, and you’ll be offline, you can right-click a file or folder and select Always keep on this device. The folder will change to a synchronizing icon, then eventually a green check. https://www.thorprojects.com/wp-content/uploads/2018/03/OneDrive.png 506 362 Robert Bogue /wp-content/uploads/2015/07/Thor-Projects-Invert-Transparent-Logo.png Robert Bogue2018-04-13 08:00:472018-05-18 08:13:56Explaining OneDrive: Will the Real OneDrive Stand Up?